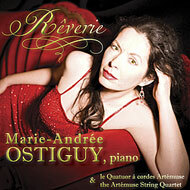 After four solo classical recordings, Marie-Andrée Ostiguy returns to composition with Rêverie, an album of piano and string quartet music. Rêverie, the third recording of compositions by Marie-Andrée Ostiguy comprises 16 evocative titles, totaling more than 73 minutes of music. An important concert tour in Québec, Canada and in Western U.S. has already started. A solid publicity campaign on television, radio and in the print medias will support the promotion of this album. “Thought is the work of the intellect, reverie is its self-indulgence. To substitute reverie for thought is to confuse a poison for a source of nourishment”. Entirely composed, performed and produced by the artist, the realization and the majority of the arrangements of this recording are signed by Gilles Ouellet (Nelligan, the symphonic version, the Québec Symphony), Marc Bélanger (symphonic tales by Gilles Vigneault) and Bruno Fontaine (collaborator of Julia Migenes-Johnson) wrote the other arrangements. In this recording, Marie-Andrée performs on a Yamaha CFIIIS piano and is accompanied by the Artémuse String Quartet. The musicians of the quartet are Solange Bouchard, first violin, Frédéric Lefebvre, second violin, Christiane Lampron, viola and Elizabeth Dubé, cello. This album was recorded at the Saint-Charles-sur-Richelieu Church in Québec, Canada, on February 24 and 25, 2007 by Carl Talbot, who also realized the mixing and the mastering at the Plasma Studio, in Montréal.